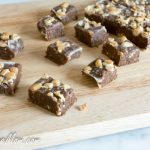 Low Sugar Salted Caramel Cashew Fudge is a creamy and decadent fudge made healthier! With one bite of this creamy fudge, you’d never know it’s healthier. Silk’s New Creamy Cashew Milk is what takes this fudge over the top to beyond amazing. 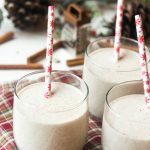 I’ve been a Silk Almond milk lover for the last 10 years, but recently I was asked to create a recipe using the New Silk Cashew Milk. I found the unsweetened version at my local Walmart Super Center and once I got home to try a glass, I was hooked. I NEVER thought anything else would win me over better than my favorite and beloved almond milk, but I was wrong, very wrong. This cashew milk is so creamy I can’t even explain how much I love it. It is my new favorite! With Christmas in 14 days, I’ve been all about creating healthier but fantastic treats for the holiday. 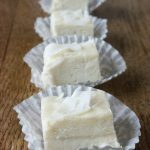 I’ve been wanting to make a new fudge for a long time. A few weeks away I had made some Low Sugar Salted Caramel sauce and then the thought of combining the creamy cashew milk with it into a fudge was all I could think about. I couldn’t make the recipe fast enough. ​My family is very picky and above anyone else, the pickiest is the hubby. If he notices a bit of aftertaste when I use my sugar free substitutes, he surely lets me know. I knew I could pull this over and win him over. Drum roll please……He has claimed this is the closet texture and resemblance to real, old fashioned, homemade fudge with sugar. WINNING! I brought this to Thanksgiving with my extended family and they too could not believe it was made with cashew milk and was low sugar. If you sign up for Silk’s eNewletter you’ll instantly receive a coupon to try the New Cashew milk! If you try it, go and tell them on their Facebook page and tell them Sugar-Free Mom sent you over! You will also find a ton of awesome new cashew milk recipes on the Silk Cashewmilk Pinterest Board. To make this dairy free, sub the butter used for a vegan butter or try coconut oil. If you don’t have liquid toffee flavored stevia, you could also use vanilla liquid stevia or plain is fine too. 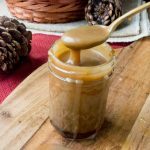 If you choose not to use any stevia you may need to increase the molasses or maple syrup. Cool slightly then taste and adjust before pouring into pan to harden. Swerve is the brand of erythritol which is a natural sugar alcohol. Melt butter and cashew butter over medium heat in a sauce pan. Once butters are melted stir in Swerve, cashew milk, arrowroot powder, maple syrup, and molasses. Bring mixture to a boil and simmer 3-4 minutes until thickened. Turn off heat and add in lquid stevia and chocolate chips. Stir well until chocolate chips are melted. Pour mixture inot a parchment lined baking pan. Top with cashews and sea salt. Refrigerate 3 to 4 hours or overnight. I’m having a bit of a love affair with cashew milk right now, too. 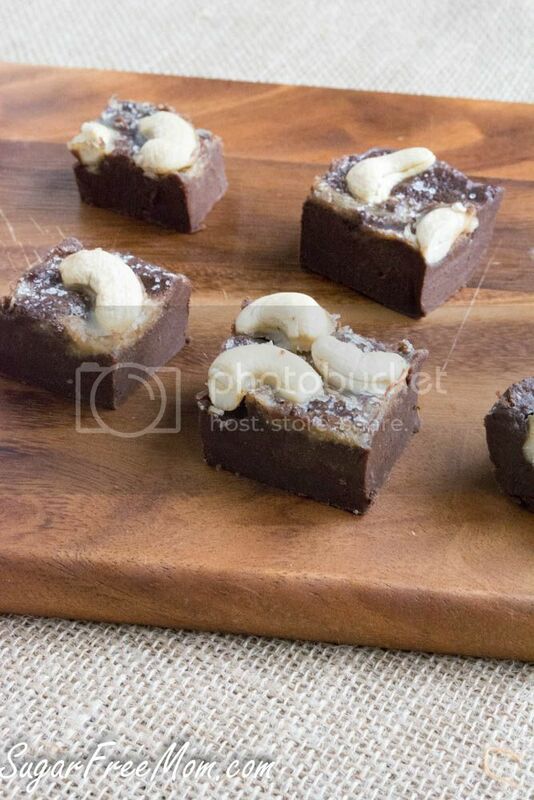 Love that you used it in this fudge (and added caramel and actual cashews). YUM! I have never tried the cashew milk, but that clearly needs to change. And that fudge sounds to-die-for! Wow! 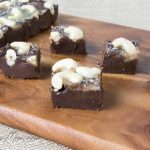 Fudge has got to be one of the hardest things to get the right texture with using less sugar. Good job! Although I drink it, I’ve never been super crazy about almond milk – but I love the new cashew milk!! 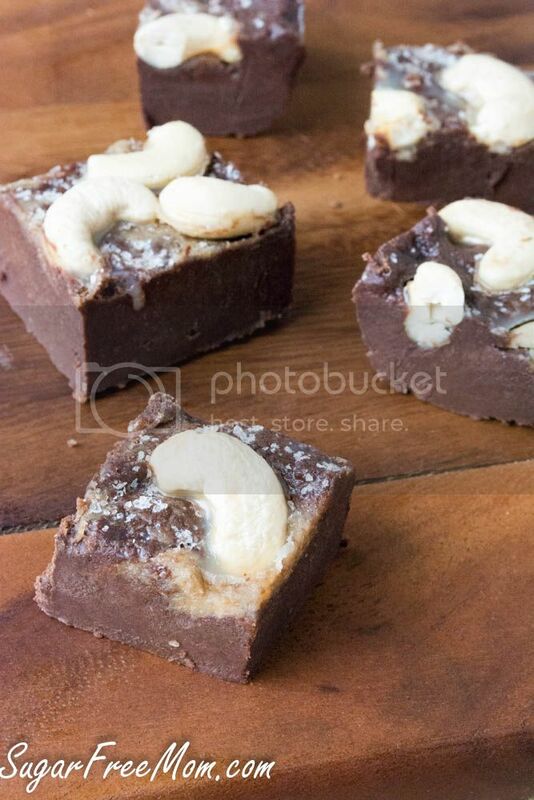 Love that it’s versatile in recipes like this delicious fudge! 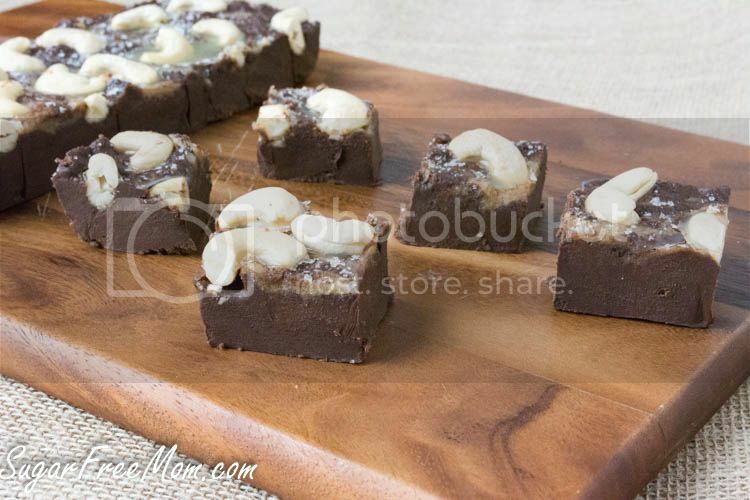 Wow, fudge texture is so difficult without sugar, sugar and you nailed it!! I love low sugar recipes. I must try this one, it seems delicious and easy to make. 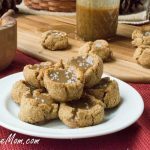 I just came across this and LOVE salted caramel! I’m guessing that I can use sugar free maple syrup? I do have organic molasses. Can I substitute xanthan gum for the arrowroot powder? I don’t have that or cornstarch. I was wondering I saw a lot of your recipies call for swerve flavored sweeteners. None of my grocery stores carry any flavored sweeteners AT ALL! Let alone serve brand that I’ve never even heard of. Do you have a website you recommend I can purchase from? 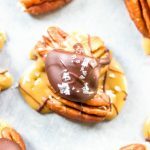 I LOVE baking and find myself on the hunt for healthier options since I’m now diagnosed with diabetes and hypothyroidism. I buy mostly all flavored stevia online through Amazon. It’s the cheapest compared to any stores and many stores don’t even sell the flavored liquid stevia except the vanilla one. I’ve seen that one at Whole Foods.